Canned green peas are probably not the first item to spring to mind when you think of wholesome, nutritious foods. However, canned peas -- although not quite as healthy as their fresh or frozen counterparts -- still pack a nutritional punch. This underrated vegetable is rich in assorted vitamins and minerals, high in antioxidants and phytonutrients, and low in fat and calories. 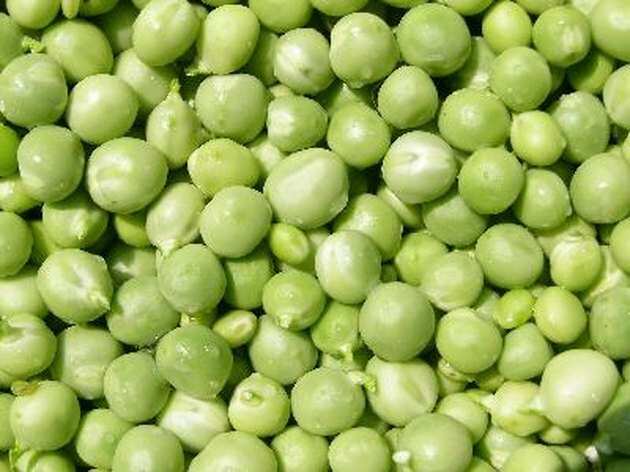 A half-cup serving of canned green peas contains 3.76 g of protein -- almost as much as the amount found in 1 tbsp. of peanut butter -- along with 10.69 g of carbs and 3.54 g of natural sugars, including sucrose, glucose, fructose and maltose. With 3.5 g per half cup, canned green peas are high in beneficial soluble and insoluble dietary fiber, which might help cut your risk of colon cancer and help you maintain a healthy weight. Naturally low in fat, canned green peas contain a diet-friendly 59 calories per half cup. Canned green peas are a good source of assorted essential minerals and vitamins. A half-cup serving of canned peas provides 17 mg of calcium -- important for strong bones and teeth -- as well as 0.81 mg of iron, which helps produce adeno triphosphate, a fuel source for the body. Manganese -- a trace mineral that helps your body produce the antioxidant superoxide dismutase -- is also present, with a half cup of canned peas containing 0.258 milligrams. In addition, a half-cup serving of canned peas provides 765 IU of vitamin A, necessary for maintaining healthy vision, mucous membranes and skin. Canned peas are also rich in carotenoids, which can be converted to retinol -- or vitamin A -- in your body. The Office of Dietary Supplements reports that high blood levels of beta-carotene -- found in peas and other vegetables and fruits -- are associated with a lower risk of chronic disease. Other carotenoids in peas include lutein and zeaxanthin. Although fresh and frozen green peas are generally superior in taste, color and consistency, canned peas' ease of storage and preparation make them an acceptable alternative for many. However, canned vegetables can be high in sodium. Norman Regional Health Systems recommends reading labels carefully and purchasing products without added salt. Peas are high in purines, a form of protein that can contribute to uric acid in the blood. If you have gout, you might need to restrict your intake of peas.